Richard L. Mabry writes killer stories. His books are white knuckle reads. I literally sit on the edge of my seat and often catch myself holding my breath as I read. Don’t take my word for it. Scroll down and read the first chapter yourself. 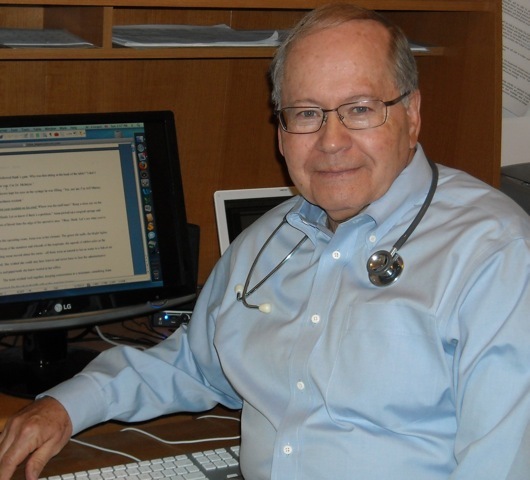 Richard L. Mabry, MD, is a retired physician and medical school professor who achieved worldwide recognition as a clinician, writer, and teacher before turning his talents to non-medical writing after his retirement. He is the author of The Prescription for Trouble Series, one non-fiction book, and his inspirational piesces have appeared in numerous periodicals. He and his wife, Kay, live in North Texas. An epidemic of a highly resistant bacteria, Staphylococcus luciferus, has ignited, and Dr. Sara Miles’ patient is on the threshold of death. 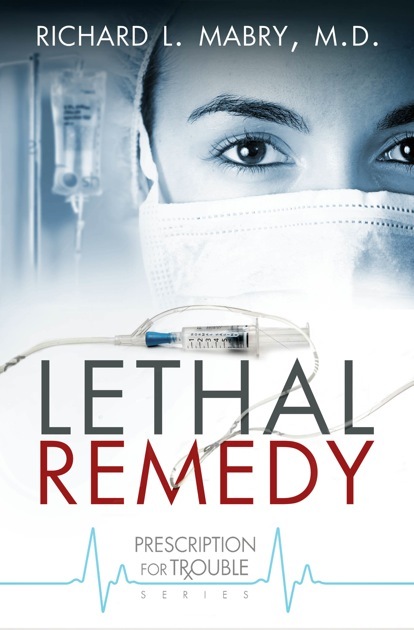 Only an experimental antibiotic developed and administered by Sara’s ex-husband, Dr. Jack Ingersoll can save the girl’s life. Dr. John Ramsey is seeking to put his life together after the death of his wife by joining the medical school faculty. But his decision could prove to be costly, even fatal. No one knew the man’s name. White male, probably in his late seventies, found unresponsive in an alley about two o’clock in the morning and brought to the emergency room. Just another homeless derelict, another John Doe. “Deal,” the intern said, and ambled off to see the next patient. Three hours later, John Doe lay on a gurney in a corner of the ER. An IV ran into one arm, a blood pressure cuff encircled the other. Spittle dripped from his open mouth and dotted his unshaven chin. His eyes were open and staring. Chelsea Ferguson lay still and pale as a mannequin in the hospital bed. An IV carried precious fluids and medications into a vein in her arm. A plastic tube delivered a constant supply of oxygen to her nostrils. Above the girl’s head, monitors beeped and flashed. And over it all wafted the faint antiseptic smell of the ICU. Chelsea’s mother sat quietly at the bedside, but her hands were never still: arranging and rearranging her daughter’s cover, twisting the hem of her plain brown skirt, shredding a tissue. Sara decided that the gray strands in Mrs. Ferguson’s long brunette hair were a recent addition, along with the lines etched in her face. Sara put her hand on the teenager’s head and smoothed the matted brown curls. The girl’s hot flesh underscored the urgency of the situation. Since Chelsea’s admission to University Hospital three days ago, her fever hadn’t responded to any of the treatments Sara ordered. If anything, the girl was worse. “Let’s slip out into the hall,” Sara said. She tiptoed from the bedside and waited outside the room while Mrs. Ferguson kissed her sleeping daughter and shuffled through the door. “The nurses will check on her, and they’ll call me if anything changes.” Sara led the way into the room and eased the door closed. This family room resembled so many others Sara had been in over the years: small, dim, and quiet. Six wooden chairs with lightly upholstered seats and backs were arranged along three of the walls. Illumination came from a lamp in the corner. A Bible, several devotional magazines, and a box of tissues stood within reach on a coffee table. “But now you know what’s causing the infection?” It was a question, not a statement. “Yes, we know.” And it’s not good news. “Yes, we do. Matter of fact, when Chelsea was admitted I started her on two strong antibiotics, a combination that’s generally effective against MRSA. But she hasn’t responded, because this isn’t MRSA. It’s worse than MRSA.” She started to add “Much worse,” but the words died in her throat. Sara paused and waited for Mrs. Ferguson to ask the next question. Instead, the woman crumpled the tissue she held and dabbed at the corner of her eyes, eyes in which hope seemed to die as Sara watched. “No, there’s a doctor at our medical center doing trials on an experimental drug that might work for Chelsea.” No need to mention that Jack is . . . No, let it go. “You realize that this drug isn’t fully tested yet. It may not work. Or the drug may cause problems.” There, she’d said it twice in different words. She’d done her duty. “Mr. Wolfe, you can come in now.” The secretary opened the doors to Dr. Patel’s office as though she were St. Peter ushering a supplicant through the Pearly Gates. Bob Wolfe bit back the retort he wanted to utter. It’s Doctor Wolfe. Doctor of Pharmacology. I worked six years to earn that Pharm D, not to mention two years of research fellowship. How about some respect? But this wasn’t the time to fight that battle. He straightened his tie, checked that there were no stains on his fresh white lab coat, and walked into the office of the head of Jandra Pharmaceuticals as though he had been summoned to receive a medal. Never let them see you sweat. Not much choice, was there? Wolfe studied his boss across the expanse of uncluttered mahogany that separated them. Pharmaceutical companies seemed to be made up of two groups: the geeks and the glad-handers. Patel typified the former group. PhD from Cal Tech, brilliant research mind, but the social skills of a tortoise. Patel had been snatched from the relative obscurity of a research lab at Berkeley by the Board of Directors of Jandra Pharmaceuticals, given the title of President and CEO, and charged with breathing life into the struggling company. How Patel planned to do that remained a mystery to Wolfe and his co-workers. Steve Lindberg ran the sales team from an office across the hall. Lindberg could memorize salient scientific material and regurgitate it with the best of them, but Wolfe would bet the man’s understanding of most of Jandra’s products and those of its major competitors was a mile wide and an inch deep. On the other hand, Lindberg had his own area of expertise: remembering names, paying for food and drinks, arranging golf games at exclusive clubs. No doubt about it, Lindberg was a classic glad-hander, which was why he had ascended to his current position, heading the marketing team at Jandra. Wolfe hid a smile. Interesting. The President of the company and the Director of Marketing. This could be big. The door behind Wolfe opened. He deliberately kept his eyes front. Be cool. Let this play out. “Hey, Bob. It’s good to see you.” Wolfe turned just in time to avoid the full force of a hand landing on his shoulder. Even the glancing blow made him wince. Lindberg dragged a chair to the side of Patel’s desk, positioning himself halfway between the two men. Clever. Not taking sides, but clearly separating himself from the underling. Wolfe studied the two men and, not for the first time, marveled at the contrast in their appearance. Patel was swarthy, slim, and sleek, with jet-black hair and coal-black eyes. His blue shirt had a white collar on which was centered the unfashionably large knot of an unfashionably wide gold-and-black tie. Wolfe wondered whether the man was five years behind or one ahead of fashion trends. He spoke with a trace of a British accent, and Wolfe seemed to recall that Patel had received part of his education at Oxford. Maybe he wore an “old school” tie, without regard to current fashion. If so, it would be typical of Patel. Lindberg was middle-aged but already running to fat—or, more accurately, flab. His florid complexion gave testimony to too many helpings of rare roast beef accompanied by glasses of single malt Scotch, undoubtedly shared with top-drawer doctors and paid for on the Janus expense account. Lindberg’s eyes were the color of burnished steel, and showed a glimmer of naked ambition that the smile pasted on his face couldn’t disguise. His thinning blond hair was combed carefully to cover early male pattern baldness. The sleeves of his white dress shirt were rolled halfway to his elbows. His tie was at half-mast and slightly askew. Patel, the geek. Lindberg, the glad-hander. Different in so many ways. But both men shared one characteristic. Wolfe knew from experience that each man would sell his mother if it might benefit the company, or more specifically, their position in it. The two of them together could mean something very good or very bad for Bob Wolfe. He eased forward in his chair and kicked his senses into high gear. “But we’re not ready. We need more data,” Wolfe said. Sara leaned over the sink and splashed water on her face. The paper towels in the women’s rest room of the clinic were rough, but maybe that would put some color in the face that stared back at her from the mirror. Her brown eyes were red-rimmed from another sleepless night. Raven hair was pulled into a ponytail because she could never find time or energy for a haircut or a perm. Get it together, Sara. She took a deep breath and headed for the doctor’s dictation room, where she slumped into a chair. Gloria opened her mouth, but Sara silenced her with an upraised hand. No sense putting this off. She pulled the phone toward her and stabbed in a number. Dr. John Ramsey found a spot in the Visitor’s Parking Lot. He exited his car and looked across the driveway at the main campus of Southwestern Medical Center. When he’d graduated, there were two buildings on the campus. Now those two had been swallowed up, incorporated into a complex that totaled about forty buildings on three separate campuses. Right now he only needed to find one: the tall white building directly across the driveway at the end of a flagstone plaza. The imposing glass façade of the medical library reflected sunlight into his eyes as he wove past benches where students sat chatting on cell phones or burrowing into book bags. He paused at the glass front doors of the complex, took a deep breath, and pushed forward. There was a directory inside for anyone trying to negotiate the warren of inter-connected buildings, but John didn’t need it. He found the elevator he wanted, entered, and punched five. In a moment, he was in the office of the Chairman of Internal Medicine. “Dr. Schaeffer will be with you in a moment.” The receptionist motioned him toward a seat opposite the magnificent rosewood desk that was the centerpiece of the spacious office, then glided out, closing the door softly behind her. John eased into the visitor’s chair and looked around him. He’d spent forty years on the volunteer clinical faculty of Southwestern Medical Center’s Department of Internal Medicine. For forty years he’d instructed and mentored medical students and residents, for forty years he’d covered the teaching clinic once a month, and today was the first time he’d been in the department chairman’s office. He swallowed the resentment he felt bubbling up. No, John. You never wanted to be here. You were happy in your own world. John couldn’t help comparing this room with the cubbyhole he’d called his private office. Now he didn’t even have that. The practice was closed, the equipment and furnishings sold to a young doctor just getting started. John’s files and patient records were in a locked storage facility, rent paid for a year. He wondered how many of his patients had contacted his nurse to have their records transferred. No matter, she’d handle it. He’d paid her six months’ salary to take care of such things. What would happen after that? He didn’t have the energy to care. Things were different now. For almost half a century he’d awakened to the aroma of coffee and a kiss from the most wonderful woman in the world. Now getting out of bed in the morning was an effort, shaving and getting dressed were more than he could manage some days. Since Beth died . . . He shook his head, trying to clear the cobwebs that clogged his brain. The knowledge that he’d never again know the happiness of having a woman he loved by his side made him wish he’d died with her. What was the use of going on? But something happened this morning. He’d awakened with a small spark of determination to do something, anything, to move on. He tried to fight it, to roll over and seek the sleep that eluded him. Instead, he heard the echo of Beth’s words: “You’re too good a physician to retire. People need you.” He remembered that conversation as though it were yesterday. She’d urged, he’d insisted. Let’s retire. I want to get out of the rat race and enjoy time with you. Retirement meant the travel they’d put off, the time to do things together. Only, now there was no more together. This morning, he’d rolled out of bed determined that today would be different. It would be the start of his rebirth. As he shrugged into a robe, as he’d done each day since her death he looked at the picture on their dresser of him and Beth. She’d been radiant that spring day so many years ago, and he wondered yet again how he’d managed to snag her. “John, I was surprised when I got your call. To what do I owe the pleasure?” Dr. Donald Schaeffer breezed into the office, the starched tails of his white coat billowing behind him. He offered his hand, then settled in behind his desk. Schaeffer nodded and tented his fingers under his chin. At least he had the grace not to offer more platitudes. Ramsey had had enough of those. “I was wondering if you could use me in the department.” There. Not the words he’d rehearsed, but at least he’d tossed the ball into Schaeffer’s court. Schaeffer pulled a yellow legal pad toward him and wrote a couple of words before he pushed it aside. “I’m not sure what I can do for you, if anything. It’s not that easy. You have no idea of the administrative hoops I have to jump through to run this department. Even if I could offer you a job today—and I can’t— I’d have to juggle the budget to support it, post the position for open applications, get half a dozen approvals before finalizing the appointment.” He spread his hands in a gesture of futility. As the two men moved through the halls of the medical center, John prayed silently that Schaeffer would find a job for him. With all his prayers for Beth during her final illness, prayers that had gone unanswered, he figured that surely God owed him this one.